PiaMiahhh is probably best termed as a Bridge variant. It is a partnership card game meant for exactly four players. Partners sit opposite each other in the corners and they work as a team to score points. In the basic version of the game, the first team to 150 (or any mutual agreeable score total) is the winner. The game uses a five-suited deck with numbers from 0-8 in each of the suits. There are also a number of special cards in the game, and you will generally have 3 of them included in any given game. 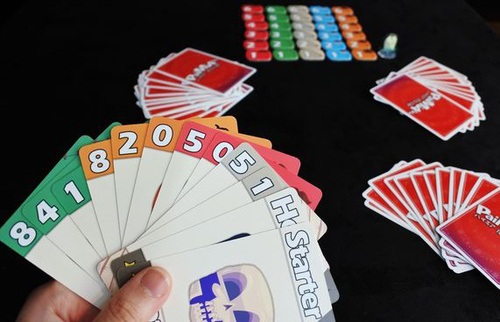 Each hand has two phases: Bidding and Trick-taking. In the bidding phase, an array of bidding tiles is laid out on the table. There are tiles numbered from 1 to 6 in each of the five colors. On a player’s turn, you can either make a bid (which must be higher than the previous bid) or pass. Like Bridge, the number on the tile designates how many tricks in excess of 6 you think your partnership will take, and the color of the tile states what color will be trump. Thus is I bid 3 Orange, I am saying that my team will take 9 Tricks with Orange being the trump suit. Bidding continues around the table until there are three consecutive passes. At this point, the player whose bid has won is called the declarer. On the score sheet, the scorekeeper should note both the number and color of the winning bid. Now, we move to the Trick-Taking portion of the game. One of the cards in the deck is called the Starter, and that player now plays the Starter to start the first trick. At this point, the partner of the Declarer now lays his hand down on the table. He is now called the Dummy for the rest of the hand, and he does not make any decisions on the playing of his cards. The Declarer gets to choose which cards get played from that hand, and the Dummy merely plays them to the table. This Starter card actually has no color nor value, and the next player then plays a card which determines the base suit of this trick. Like most trick taking games, you must follow suit if possible. However, if you are void in the lead suit, you are free to slough any color card. If you slough a trump card, you take the highest numbered bidding token from the column of that color from the grid on the table. If you slough a non-trump suit, you instead take the lowest available token of your card’s color. Each player plays one card onto the trick, and then you determine the winner – this is the highest numbered card of the suit which was led, unless trump has been played to that trick, in which case the highest numbered Trump card wins the trick. The cards in the trick are collected and stacked neatly so that it is clear how many tricks have been won by each team. The winner of the previous trick leads a card to start the next trick. There are a few special cards in the game – the Starter card which I mentioned above as well as 8 other ones – 2 of those 8 will be in the deck. The rules for each are slightly different, and the game will therefore play a bit different depending on which specials are in the game. This continues until all twelve tricks are played out. Now the hand is scored. 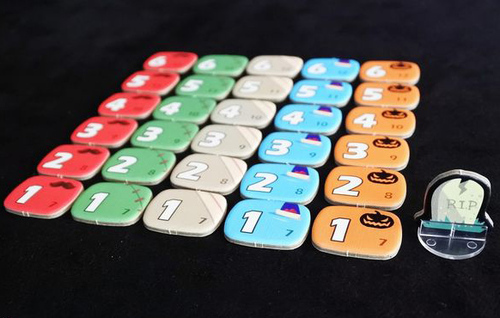 Each team scores points for each trick taken – the score is equal to the large white number on the bidding tile. Thus, if we had played my 3 Orange bid, each trick taken is worth 3 points. However, the team which won the bid only scores points here if they have made their bid – that is, they have taken at least as many tricks as the large number + 6. If they have failed to take the right number of tricks, they score no points here. Then, each team scores points equal to the tiles which they have collected this hand (from sloughing off suit cards during play). Again, the game goes until one team has eclipsed the pre-set points goal. Overall, this is a very interesting take on the Contract Bridge family. The five suited deck as well as the bidding grid take much of the pre-set bidding conventions out of play. I’m sure that you could develop your own new conventions for this game, but at least from the start, everyone has to feel out their own bidding strategy. The trick scoring which is centered on the bidding is a clever way to generate tension in the game. Your team will generally do better if you get to decide the trump suit (because it goes without saying that you’ll likely choose a suit that you have a lot of) – but the points that you give up for missing the bid keep you from being over-exuberant in your bidding. Additionally, the scoring given for sloughing leads to some interesting decisions. It helps keep players in the game, and it also gives value to some bad hands. I’ve had hands where I didn’t win a single trick, but my hand was still able to contribute 15 points to my team through the collection of scoring tokens when I was able to slough cards in suits that I didn’t have. There were also a few interesting “cross-slough” situations where my partner was able to double up: he was able to bleed trump out of the other team while also scoring points by sloughing cards out of my sorry hand which had no trump. 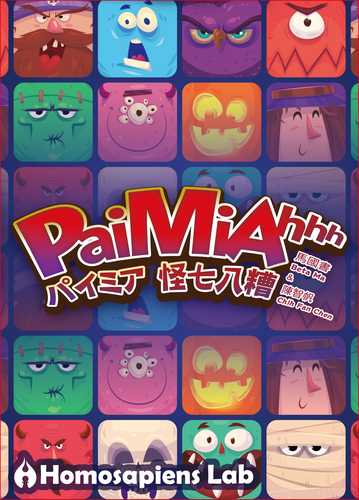 I think that PiaMiahhh is a great trick taking game, and could be a valuable tool in teaching players how to learn to play Dummy hands for Bridge – because here, you can get into a game much easier as you don’t have to learn any of the arcane bidding rules which can befuddle novice Bridge players. 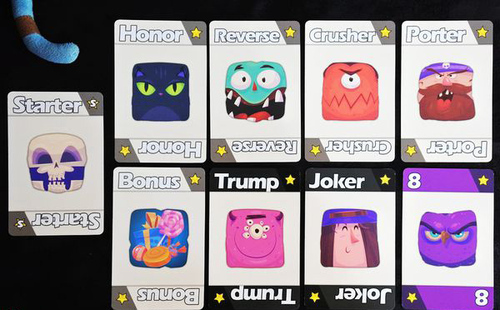 The special cards in the game also add a bit of spice and variety to each game, and they can keep the game from getting stale – the approach to a particular hand can definitely change depending on which special abilities are in play at any time. I’ve yet to get a game of Bridge going in my local group, but PiaMiahhh has been a big hit, and I think a game that will continue to hit the table in the months to come. I liked the game and would be happy to play again. I expect hard-code Bridge players will not be interested but other card players will be as it is more accessible than Bridge.